E-Glo is an all-tube design completely free of semiconductors in its signal path. Its tube complement consists of the classic glassware beloved of audiophiles: four ECC83s and two ECC88s. The use of these valves will ensure that supplies of replacement tubes are always readily available, while experimentation is encouraged for those who love to fine-tune the sound of their systems by changing tubes, such as EAT's premium offerings. In the fully-balanced input stage, we fitted a Lundahl step up transformer with an amorphous core, type LL1932. The unit's gain is 45db, plus the voltage gain of the step-up transformer. E-Glo's amplifier section uses split, fully passive equalisation, without any equalisation in global negative feedback loop, which can harm the sound. At this level of performance, only the best components will suffice. The choice of output capacitor is the highly-praised Mundorf. All other capacitors are WIMA. Mundorf Connectors with Teflon insulation have been chosen for their unparalleled integrity. To ensure the utmost flexibility, to ensure perfect matching to a wide range of cartridges, the E-Glo provides capacitance loading for moving-magnet types in six user-switchable steps from 47pf to 900pF. "The loading resistance for moving-coil cartridges is continuously adjustable", says Lichtenegger, as we already have on our Phono Box RS. 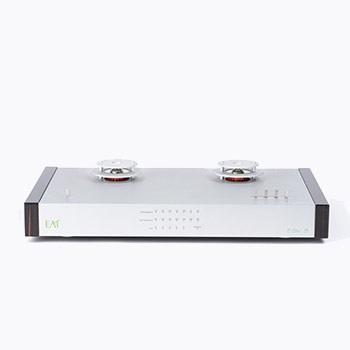 E-glo S is a hybrid phono preamplifier that utilizes ECC83 tubes (twin triode) in the first and second gain stages In order to get higher gain and lower noise we use in the first stage a cascode connection of tube with with two paralelly connected low-noise J-FET transistors. RIAA curve is equalised fully passive and splitted in two steps which allows to achieve perfect impedance matching between the gain stage and equalization block. 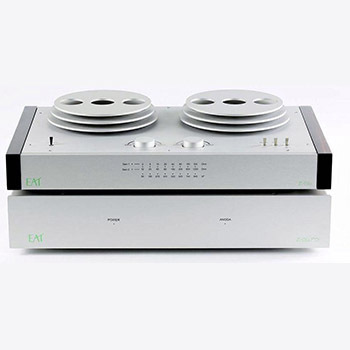 Phono preamplifier doesn't have any global feedback. 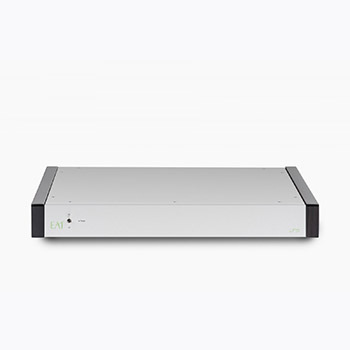 It has a massive aluminium chassis, large possibility of adjusting the impedance, capacity and gain. It has subsonic filter with mild effect which doesn't affect audible frequencies in unpleasant way. Elegant power supply. We at E.A.T. strongly believe that power supply is a part of signal path and the quality of power supply extremely significantly contribute to the sound quality. It is done without any compromise. Full bridge rectifying use for ultra-fast diodes followed with 8800uF filtration bank. Voltage regulator is fully discrete. No operational amplifier is used. Voltage reference is TL431. This all result in very low noise and perfect regulation. In many aspects it also over-performing battery power supply. Ripple voltage is lower than 1 microvolt! Voltage accuracy is better than 0,05%. The temperature drift is beyond every level of standard power supplies. LPS is Dedicated for E.A.T. phono stages and turntables.